GRAND RAPIDS, Mich. – To continue its efforts to fight hunger in the communities where SpartanNash associates live and work, the SpartanNash Foundation – the company’s charitable giving arm – recently made a series of $5,000 donations to 16 food pantries in 13 states. The donations also continue the Foundation’s 13-year tradition of supporting local food banks during the holiday season, giving each SpartanNash distribution center the opportunity to personally select its partner pantry and provide food for those who need it most. Since 2004, the company’s distribution centers have donated more than $1 million to community food bank and pantry partners. SpartanNash distribution centers also support their local food banks throughout the year by donating food items and other goods. In 2016, SpartanNash donated 5.525 million pounds of food to food banks, churches, schools and other organizations serving those in need in our communities. In September 2017, the SpartanNash Foundation also hosted a companywide scan campaign to end hunger. 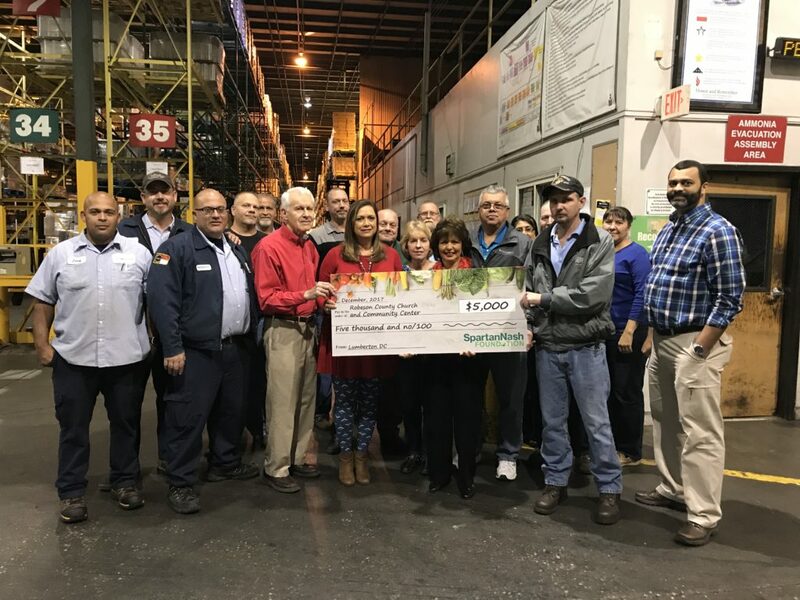 Store guests and company associates who visited any SpartanNash corporate-owned store during the 12-day retail scan campaign had the opportunity to donate $1, $5 or $10, with 100 percent of dollars raised going to support community food pantries and food banks. Coupled with a company donation, the scan raised $260,000 to support more than 100 local food pantries and food banks. Through the scan campaign to end hunger, the SpartanNash Foundation also provided $62,000 in donations to community food pantries located near its distribution centers in Fargo, N.D.; Omaha, Neb. ; and Grand Rapids, Mich. The SpartanNash Foundation was formed in 2013 following the merger of the Nash Finch Company and Spartan Stores. It represents the best of the NFC Foundation and the Spartan Stores Foundation. The SpartanNash Foundation is the charitable giving arm of SpartanNash and is focused on providing grants to nonprofit community partners who are working to end hunger, provide shelter and support our military heroes. To learn more about the SpartanNash Foundation, visit spartannash.com/Foundation. SpartanNash (Nasdaq: SPTN) is a Fortune 350 company whose core businesses include distributing grocery products to independent grocery retailers, select national accounts, its corporate-owned retail stores and U.S. military commissaries and exchanges. SpartanNash serves customer locations in 47 states and the District of Columbia, Europe, Cuba, Puerto Rico, Bahrain and Egypt. As of today, SpartanNash currently operates 145 supermarkets, primarily under the banners of Family Fare Supermarkets, VG’s Food and Pharmacy, D&W Fresh Market, Sun Mart and Family Fresh Market. Through its MDV military division, SpartanNash is a leading distributor of grocery products to U.S. military commissaries.